Kouu Ikou, a 26-year-old Japanese IT worker at a Sino-Japanese enterprise in Tokyo, first came to China six years ago when he was still a university student on an internship. His destination was the bustling city of Guangzhou in Guangdong Province. As a heavy smoker who had begun sneaking his father's cigarettes as early as primary school, one of the first things he did was go out to buy some cigarettes. 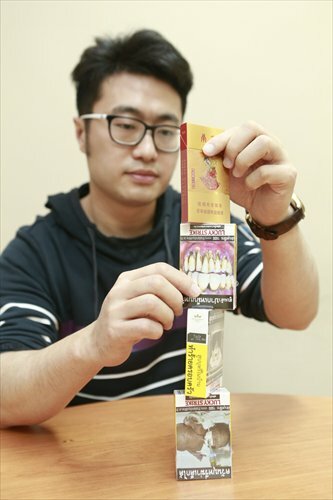 "I remember that I took 100 yuan ($15.42) with me, in case the cigarettes were expensive like in Japan, where you pay around 50 yuan for a pack of middle-grade cigarettes like Mild Seven," Ikou said. So he was surprised when he found that a pack of Shuangxi (double happiness) cost him less than 10 yuan. He also noticed something else: "China's cigarette packages are all neat and better designed than those in Japan," Ikou said. This isn't a matter of sheer aesthetics - in Japan, as in more than 45 countries around the world, cigarette manufacturers are required to include graphic health warnings on their packaging, including photos of rotting teeth, cancerous tumors, people with stomas and even dead bodies. Ikou also says Japanese cigarettes feature textual warnings regarding the health effects of smoking. "It's like they want you to read an entire scientific paper before you light up," he jokes. "There are eight kinds of warnings in Japan, and some brands print all of them on their packages." By contrast, Shuangxi - which remains Ikou's favorite Chinese cigarette - offers up auspicious-looking red packaging that wouldn't look out of place at a formal banquet. "The Chinese character is symmetrical and I know the meaning, which is happily married," said Ikou. "An old cigarette seller told me once if I kept smoking Shuangxi cigarettes, I'd find a girlfriend soon." Luckily (or unluckily) for smokers of Chinese cigarettes, it doesn't look like graphic warnings will be coming to China anytime soon. During an interview with Beijing newspaper the Legal Mirror at the recently concluded Two Sessions, Duan Tieli, deputy head of the State Tobacco Monopoly Administration (STMA) and a representative of the National People's Congress, affirmed that China has no plans to require such warnings on its cigarette packages. Duan said photos of smokers' rotten lungs, bad teeth, skulls and dead babies are not "in line with" traditional Chinese cultural values. He also stressed that China has strictly followed the WHO's Framework Convention on Tobacco Control (FCTC) - an international agreement aimed at establishing universal standards for warnings about the dangers of tobacco products - since signing the treaty in 2003. This isn't the first time that China has bumped up against the question of the implications of its cigarette packaging. According to a March 16 report by the Beijing Youth Daily, during one FCTC conference in 2008, the Chinese representative announced that "the beautiful designs of Chinese landscapes on our cigarette packages are the essence of China's traditional culture and profound history," adding that changing them to such pictures would represent humiliation and disrespect to the Chinese people. As a result, the Chinese government "reserves our views based on our national sentiment and civilization." According to Han Meiling, a Beijing-based psychologist, smoking has long been an important part of Chinese culture, making its way both into people's daily lives and into special occasions. "Cigarettes are present on happy occasions like weddings and family reunions," Han says. "Everyone knows smoking is bad for your health, but without a direct graphic representation of that, the sense of disgust toward smoking is hard to achieve simply through written words." According to the Legal Mirror report, over 45 countries and regions across the world, including Hong Kong and Taiwan, have followed the WHO's recommendations by requiring that graphic and textual warnings cover at least 30 percent of each pack's packaging, while 20 of those countries and regions have gone further in requiring that at least 50 percent be covered in warnings. But Chinese cigarette packages only have bland textual warnings that "smoking may be harmful to your health" written on them. For foreigners like 28-year-old Ashley Nowka, an English teacher and mother of two young children, the lack of obvious warnings on cigarette packages, and general lack of concern regarding the dangers of smoking, are a cause for concern. "I've already talked to my children about smoking, and I do worry about their future," says Nowka, who was initially dismayed to find that in China, the shops sell cigarettes to everyone regardless of age, even to children. "And also the pretty packages are a lure to curious little ones." Yet it isn't just special occasions and habit that have helped Chinese smokers form such close attachments to their cigarettes - it's the local nature of cigarette brands, whose packaging often draw on cultural, historical and geographical features. "I am from Heilongjiang Province, and there we have brands named directly after Harbin, the capital of the province," says Dora Zhang, a Beijing tour guide, adding that it seems that the longer the history and the more profound the culture a city or province has, the more famous and well-known its local cigarettes are. This isn't just an insidious bid at currying hometown favor; it has to do with the very structure of China's tobacco industry. Unlike other major tobacco companies around the world, China Tobacco Corporation - the biggest entity of its kind in China - does not directly produce and sell cigarettes, but rather farms that work out to 33 commercial corporations across the country, according to chinatobacco.com, a website about the Chinese tobacco industry. These corporations are in charge of everything from market strategy to brand development, and with multiple major companies competing for a slice of the local market in each province, many end up working regional landmarks into their branding in hopes that some of their grandeur will rub off, according to the website. Many Chinese people also purchase cigarettes as local specialities and souvenirs to give to their friends and relatives as gifts. "[Even] many foreign tourists ask me where to buy authentic Zhongnanhai, and they wonder why the highest leader's residential palace serves as the name of a cigarette," says Zhang. According to a 2015 report on adult tobacco consumption released by the Chinese Center for Disease Control and Prevention (CDC), China is home to over 316 million smokers, 15 million more than in 2010. Each smoker consumes an average of 15.2 cigarettes per day, an increase from 2010's average of 14. The report's findings on the effects of warnings were bleak. More than 80 percent of interviewed smokers said they didn't care about the warnings printed on cigarette packages, and 74 percent claimed that they were "totally unafraid of the hazards brought by smoking." Additionally, although 80 percent of Chinese people were aware that smoking can cause lung cancer, only 31 percent knew that it increased the risk of stroke, and 19 percent that it could cause impotence. Still, there may be hope in other measures besides graphic photo warnings. According to a report by the Beijing Evening Daily in December, Beijing's recent smoking ban has raised public awareness about the dangers of smoking. Another deterrent that's worked elsewhere is price hikes. According to a report by Caijing Magazine last May, China raised its tobacco tax for the third time ever in 2015, resulting in a six-percent rise in tobacco wholesale prices, and a seven-to-10 percent rise in retail prices. This means that the tax now accounts for 55 percent of the entire price of a pack. Though this is far below the 70-percent marker recommended by the WHO in 2014, it's a step in the right direction. Of course, none of these measures will necessarily work to kill the emotional and aesthetic attachment that so many people - smokers and non-smokers alike - in China feel for their cigarettes. A case in point is the tour guide Zhang, who says she used to collect her grandfather's cigarette boxes that he got from Russia, which featured beautiful, artistic packaging. "However, when I went to Russia recently, I found that the delicate boxes had all been replaced with horrible ones, and I learned that they passed legislation in 2013 to change the design of all the cigarettes sold in the country," said Zhang. "It's a pity the artwork-like boxes are gone, but I guess it's also a good thing."